We maintain the right to choose buyers at our own discretion, as it is vital the right puppy go to the right home! 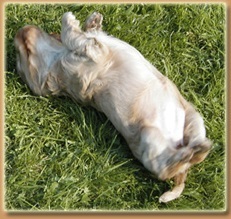 If you are interested in a puppy, please send an E-mail telling us about what kind of doggie life you can offer. A puppy is reserved at no earlier than three weeks of age upon payment of a non-refundable down-payment equivalent to 15 % of the full price. Down-payment is only refunded in case of puppy not passing veterinary check and buyer consequently chooses not to go through with purchase. The remainder of the price should be paid in connection with delivery, preferably by bank transfer. Please note that installments are not accepted. No puppy will be sold without buyer having come to view it at least once before delivery. Export enquiries are welcome; however, we will not sell to countries where Animal Welfare Laws are poor or non-existent. All extra costs pertaining to export must be paid by buyer.